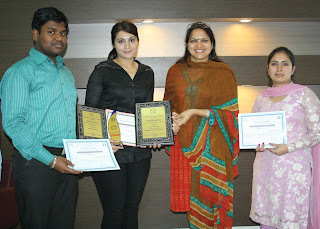 Jalandhar: Three research students of Lovely Professional University have brought laurels to the University as they won the National Student Research Convention ‘Anveshan 2013’ award at Tata Institute of Social Sciences (TISS), Mumbai. National Student Research Convention is considered to be the biggest platform to represent research paper/project by any student and is organised annually by Association of Indian Universities (AIU). The Jury which consisted of reputed scientists from top organisations and institutions like Homi Bhabha Centre for Science Education and IITs judged 75 shortlisted participants from five zones. In the judgment Navjot Kaur Khaira, who is M Tech II year student, bagged second prize for her paper on“High reliability Micro Electro Mechanical Switches (MEMS) for Radio Frequency applications.” She was also given a cash prize of Rs 20,000. Kunal Adhikari (B Sc Agriculture, I yr) and Renuka (M Pharma, II yr) were applauded for their remarkable national participation through posters and power point presentations in the categories of Agriculture and Health Sciences. awesome information thanks and congratulations dear. That was very interesting article..
install plotagon story for Windows.